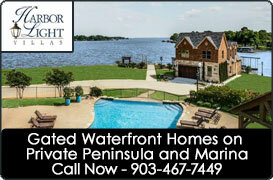 SOLD - Stunning Newer Construction Waterfront Home under $300,000! SOLD! Soaring ceilings with gorgeous custom stone wood-burning fireplace. This 3-Bedroom/3-Bath waterfront home with 2-car Garage has a ground-level Master Suite on the lake side, a second Bedroom on the 1st floor, and a huge Bedroom and Bath upstairs PLUS walk-in closets with 'built ins'. It features walls of glass overlooking a large 50-foot deck.